Musings 'n scribblings of a philanthrope .. : Fr. 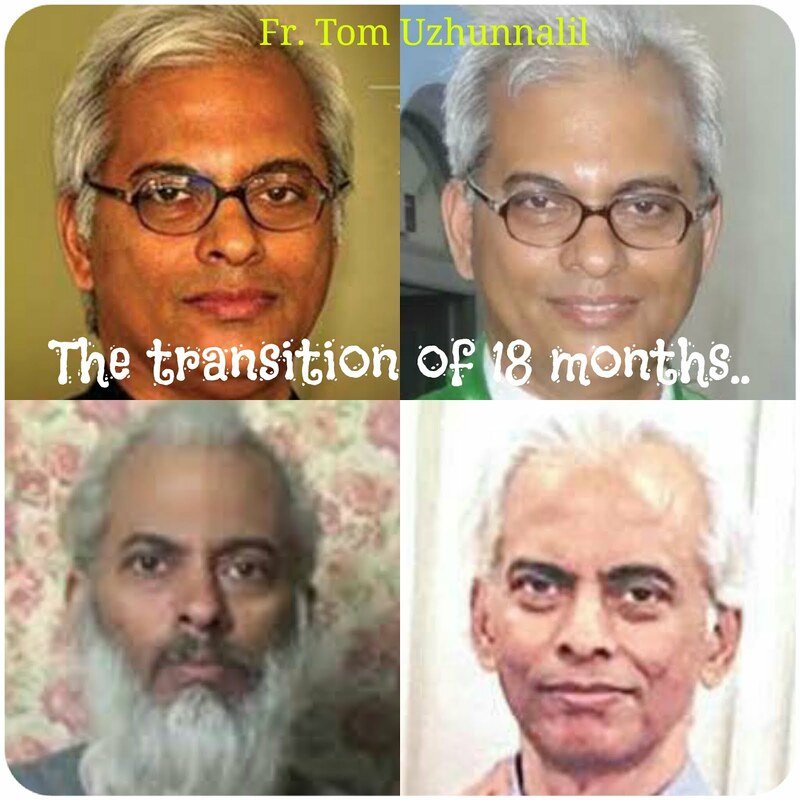 Tom Uzhunnalil, interview after release from Yemeni captors ..
Fr. Tom Uzhunnalil, interview after release from Yemeni captors .. While his colleagues, five nuns were shot dead, Fr. Tom was spared. Here is an interview he gave to ANS after his release. (ANS – Rome) – Father Tom Uzhunnalil answers a few questions, an ANS exclusive. It was a long waiting and I did not know what to do except to pray. My hand and legs were tied and my movements limited for a few days only. I have spent my time praying as much as possible, for as many intentions possible. I used to sleep, pray, think of my technical classes and prepare some lessons etc and go to sleep each night. Each day used to go like that and I had no communication at all from the outside world, nor did I know where I was put up also. My captors did not ill treat me or torture me. They gave me food all the three times and they asked me one time details about me, my family, the places visited, the people I know etc. I was their captive and the whole day I used be sitting on the ground on a sponge like material with my hands and legs tied, and when I am tired, I used to sleep a bit or lay down, and my days went like that. It was on 4th of March 2016, Friday, after the Eucharistic Adoration and Eucharistic blessing in the morning for the five sisters, I had breakfast. Then I spent some more time in the chapel for personal prayer. Around 8.40 am, I just came out of the sister's house. I heard a gun shot almost immediately, and one of the attackers held my hand and I declared I am an Indian. He made me sit in a chair, near the security room, near the main gate of the campus of the institution. The sisters were already at their place of work with the old people. The main man of the attackers went to the place of work, and brought out two sisters first, and went back again and brought another two sisters near to the main gate. He went and looked out for the fifth sister but could not trace her in the campus. Then he returned back to the place near the main gate, where the sisters were kept. Then he took two sisters first, moved them to some distance out of my sight and shot them, then he came back and took the other two in my vicinity and shot them, all these took place within the campus. I only prayed to God to forgive the sisters and the persecutors and have mercy on them. I did not cry, nor did I have any fear of death. Then he took me and put me in the boot of the car, which they parked near the campus, and closed the door of the boot of the car. He entered the sister's chapel, brought the tabernacle with the blessed sacrament in it and threw it in the boot of the car, where I was closed and kept in. They drove away the car with me in it. I was experiencing a great distress. I prayed to God to be merciful to the sisters and the others who were killed and to forgive the killers. I prayed to the Lord to give the grace and strength to accept his will and remain ever faithful to God, till I am faithful to the mission, he has for me in this life, here on earth. The major part of my time be it day or night whenever I was awake was dedicated to prayer. I used to start the day with the angelus, followed by one our father and hail mary for each of the sisters who died, then go on to pray for my province, congregation, parish, family remembering as many as possible and praying for them. I used to pray also for my captors and ask the Lord to forgive them and pray for their conversion. I had no host or wine, nor any missal or lectionary, but I used to celebrate a spritual mass everyday. I used to offer it to the Lord, and for the readings each day I used to take some incident of the old testament or the new testament, and for the gospel some miracle, or parable or some episode in the life of Jesus and meditate. I used to also pray for all the deceased salesians, family members, parishioners and all people I knew. I used to keep on praying for as many intentions I could pray for. I also prayed that if it was the Lord's will that I should be freed, I prayed for my deliverance also. I used to pray the rosary often. Sometimes, I could not pray also, because they used to talk in Arabic and I could not concentrate on anything, in my mind. It was well planned by them. They used to tell me in advace that they were making a video to make an appeal to get some money, I had no other go than to obey them. They used to also shoot as if they were hitting me, and make some noise, but they never harmed me. They were hoping that these clippings would fetch them the ransom quickly. The Lord has done a great miracle for me and given me another life. If he has saved me, it means he has still some plan for me and he wants me to live for Him and be a witness. I want to thank God the alimighty, the Church authorities both in India and Vatican, the Salesian Congregation, the family and to each an every single person who has been praying for my release. Definitely it is because of the prayers, that my life was spared. This is also a big grace bestowed on me because of my captivity. I wept profusely before him sharing with him my experience. He was so sympathetic, compassionate and concerned and he kissed my hand twice. I cannot expect anything more than this, I have been given a new life and I requested the Holy Father to thank all the people for the prayers offered for me all over the world. Right now, I feel physically weak, but with the medicines and food I am also beginning to feel better. I need to do a couple of medical tests and I hope I will be able to recover soon. When I was in Aden, I used to weigh 82 kgs and after my release when I checked my weight, I was 55 kgs and now with the food and medicines that I am taking the last two days, I am improving. I am sure I will feel better, because God's grace and the prayers of the people are helping me. I have no plans except to do God's will, and that will be expressed to me through the Superiors of the Salesian Congregation. I would definitely love to get back to India and thank all the people and meet all my people, but I shall wait till the doctors certify that I am fit to travel. It may take some more time, and I am ready to wait for some more time.